Yeung, Henry Wai-chung (ed.) (1999), The Globalization of Business Firms from Emerging Economies, Two Volumes, Cheltenham: Edward Elgar. Download my 54 pages Introduction to both volumes . See reviews in Economic Geography (2001). Yeung, Henry Wai-chung (1999), 'Introduction: competing in the global economy ', in Henry Wai-chung Yeung (ed. 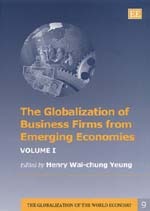 ), The Globalization of Business Firms from Emerging Economies, Two Volumes, Cheltenham: Edward Elgar, pp.xiii-xlvi. Yeung, Henry Wai-chung (1999), Singapore's Global Reach: An Executive Report , Singapore: Department of Geography, National University of Singapore, 36pp. 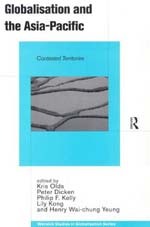 Olds, Kris, Dicken, Peter, Kelly, Philip, Kong, Lily and Yeung, Henry Wai-chung (eds. )(1999), Globalisation and the Asia-Pacific: Contested Territories, London: Routledge. See reviews in Economic Geography (2001). Yeung, Henry Wai-chung (1999), 'Under siege? Economic globalisation and Chinese business in Southeast Asia', Economy and Society, United Kingdom, Vol.28(1), pp.1-29. Yeung, Henry Wai-chung (1999), 'The internationalization of ethnic Chinese business firms from Southeast Asia: strategies, processes and competitive advantage ', International Journal of Urban and Regional Research, United Kingdom, Vol.23(1) pp.103-27. Reproduced in Asia Pacific Media Network Brief. Yeung, Henry Wai-chung (1999), 'Regulating investment abroad? The political economy of the regionalisation of Singaporean firms ', Antipode, United States of America, Vol.31(3), pp.245-73. Olds, Kris and Yeung, Henry Wai-chung (1999), '(Re)shaping "Chinese" business networks in a globalising era', Environment and Planning D: Society and Space, United Kingdom, Vol.17(5), pp.535-55. Yeung, Henry Wai-chung (1999), The Political Economy of Singaporean Investments in China, EAI Working Paper No.22, East Asia Institute, National University of Singapore, Singapore. Yeung, Henry Wai-chung (1999), 'The regionalisation of Chinese entrepreneurs', in Leo Paul Dana (ed. ), International Entrepreneurship, Singapore: NTU-Entrepreneurship Development Centre, pp.295-304. Dicken, Peter and Yeung, Henry Wai-chung (1999), 'Investing in the future: East and Southeast Asian firms in the global economy', in Olds, Kris, Dicken, Peter, Kelly, Philip, Kong, Lily and Yeung, Henry Wai-chung (eds. ), Globalisation and the Asia- Pacific: Contested Territories, London: Routledge, pp.107-28. Coe, Neil M. and Yeung, Henry Wai-chung (1999), Grounding Global Flows: Constructing An E-Commerce Hub in Singapore , Paper Presented at International Conference on Global Networks, Innovation And Regional Development: The Informational Region as Development Strategy, University of California, Santa Cruz, 11-13 November 1999.